You can now reach all of your field personnel regardless of whether they use MOTOTRBO, ASTRO 25 or a conventional radio system from the MIP 5000 VoIP Radio Console. No cable routing, no drilling and no leased lines, Motorola’s MIP 5000 VoIP radio console uses your multicast-enabled IP network, simplifying the installation to save time and money. You can implement it anywhere on your IP network: onsite, offsite or even wirelessly in a field dispatch facility. The MIP5000 Console virtual control heads can mimic the control head for MOTOTRBO, ASTRO 25 and conventional radio systems including MOTOTRBO Conventional, MOTOTRBO IP Site Connect, MOTOTRBO Capacity Plus, and MOTOTRBO Connect Plus Systems. 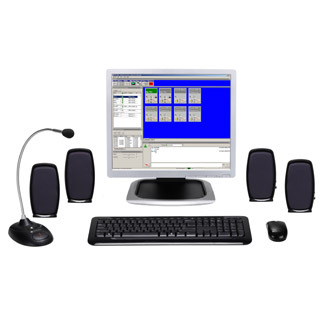 Whether operating a computer in the dispatch center or an advanced device in the field, the MIP5000 VoIP Radio Console allows personnel and operators to talk, listen and respond wherever a network connection is available. Control up to 48 conventional radio channels. With the look and feel of familiar application menus and icons, the MIP5000 software is easy to learn and simple to operate. The customizable GUI provides multiple screen layouts to organize resources by agency, shift or other criteria to meet the needs of the user. The dispatcher can also use a simple drag and drop action to patch together dissimilar radios or connect an inbound call to a radio channel. Built-in network monitoring tool alerts the operator when audio quality may be affected due to degraded Ethernet network conditions. MDC signaling features includes PTT ID Alias, Emergency, Call Alert, Selective Call, Frequency Select and Radio Enable / Disable, Voice Alert, Remote Monitor, Status Request, Repeater Enable/Disable and Manual RAC. Available accessories include a gooseneck microphone, footswitch and quick disconnect headsets. Logging options for the MIP5000 Console include the Incident Recall Recorder (IRR) for an on-board co-habitated logger or any existing analog logging recorder which can be used with the appropriate digital junction box.